The demonstration in Hong Kong saw enormous crowds chanting “CY Leung, Quit!” as the new chief executive has recently been drawn into a series of scandals involving illegal construction at his home, an issue that brought down his opponent during the ‘small-circle election’ in March. 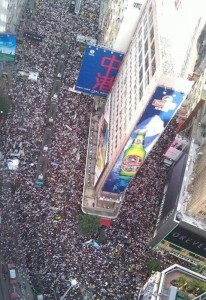 July 1 is undoubtedly the most special day of year for the people in Hong Kong. For one, it is a public holiday commemorating the handover of the city to China from the British colonial rule. 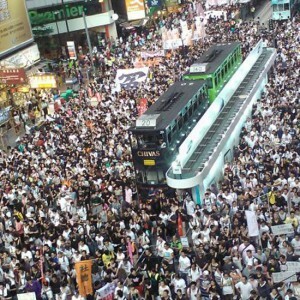 On the other hand, pan-democratic parties and groups have been organizing the annual July 1 demonstration in Victoria Park since 2003, when 500,000 people protested against the notorious Article 23 national security law. This year’s July 1, Hong Kong also sees the new chief executive, CY Leung, sworn into office. The scandals, as well as a fear among the masses of harsher police repression, confirmed by the use of huge water-filled barricades and the often-used pepper spray against unarmed protesters, and the future revival of Article 23, led to a surge in the turnout of this year’s event. The traditional pan-democratic parties have all taken part in the demonstrations, including the right-wing Democratic Party and Civic Party, and the more radical League of Social Democrats and People Power. There are also many different smaller NGOs and political groups participating. Very significantly, the July 1 demonstration for the first time saw groups of protesters from mainland China bringing banners and chanting their own demands, which included, “End corruption, defend the constitution!” by some youths from Suzhou, and another group of peasants from Huizhou protesting against the “Theft of peasants’ land by the Daya Bay nuclear plant”. Alarmingly, more than 100 people from the racist anti-mainlander Hong Kong Autonomous Movement marched with their Hong Kong British colonial flags. Socialist Action (CWI in Hong Kong) always stresses the need for a united struggle of the Hong Kong and Chinese working class against the one-party dictatorship in China. The main slogans of protesters were “CY Leung, quit!” “Down with Article 23”, and “Universal suffrage now”. 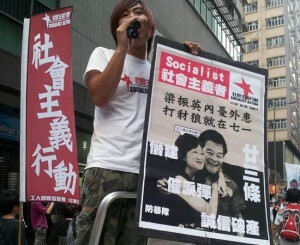 Other demands included for a universal pension system, 8-hour working day, HK$35 (US$4.50) minimum hourly wage, etc. The recent highly suspicious death in China of veteran labour activist Li Wangyang has also generated great anger and calls for an independent enquiry, increasing the pressure on Leung, who has tried to maintain a stony silence on the issue. The newly sworn in chief executive, CY Leung, was “elected” by a 1200-man committee consisting only of big capitalists and corporations and some professional groups, winning just 689 votes. He was picked by the Chinese regime (CCP) after a massive scandal pulled down his main opponent, Henry Tang Ying-yen, when Tang was discovered to have illegally built a 2000 sq. ft. underground cellar. CY Leung, being a professional surveyor himself, has always insisted he was ‘clean’ of such constructions during the election campaign. It has however since been discovered that he has as many as six illegal structures in his HK$500 million property in the most exclusive part of Hong Kong. This emerged just a week before he was sworn in. Together with the corruption scandal over luxury foreign trips that plagued the out-going chief executive, Donald Tsang Yam-kuen, this triggered widespread anger among the masses that such officials chosen by the ‘small-circle election’ are all corrupt and dishonest. There is also a general fear among the public that CY Leung represents a much more repressive form of rule in Hong Kong. His rule is being nicknamed “(Beijing) Liaison Office regime)”; due to rumours he is an underground member of the CCP. The recent visit of the Chinese President, Hu Jintao, to Hong Kong showed images of him reviewing 3,000 PLA soldiers, as well as 10,000 police being mobilized to protect him with pepper spray and large water-filled barriers against unarmed protesters on June 30. This process has been dubbed as the “CCP-isation” of Hong Kong. The recent blocking in the pro-establishment dominated Legislative Council (Hong Kong’s pseudo-parliament) of a government attempt to rush through CY Leung’s plan to expand his government, underlined that there is now a deep split between the Tang camp and the Leung camp of the capitalist establishment. 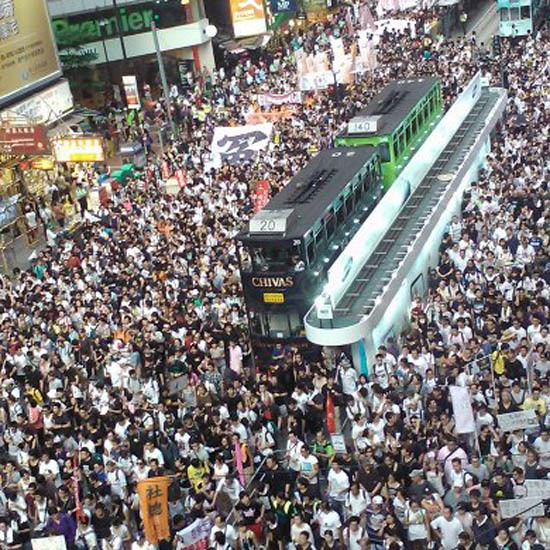 Together with such enormous public anger as reflected in the July 1 demonstration, the coming CY Leung government will not be the ‘strong’ government he undoubtedly is aiming for. His attempts to impose new repressive laws are likely to meet with more mass struggles in the future. Few governments in the world have got off to such a bad start as CY Leung now faces. Rather than the sort of ‘honeymoon’ most governments get at first, he faced a huge demonstration telling him to resign on his first day at work. “We have 5 percent of the population asking him to step down and focusing on his intergrity,” commented Ivan Choy of Chinese University of Hong Kong – referring to the crowd’s size relative to Hong Kong’s population. 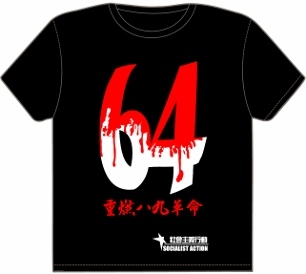 The anniversary has also meant new opinion polls showing growing opposition towards CCP control. Only 16 percent feel that Hong Kong has benefited from the return to Chinese sovereignty. This coincides with the widening wealth gap and housing crisis, with Hong Kong now the most unequal city in Asia. Hong Kong’s Gini coefficient (a measure of wealth disparity used by the United Nations) is at its highest (most unequal) since records began in 1971. 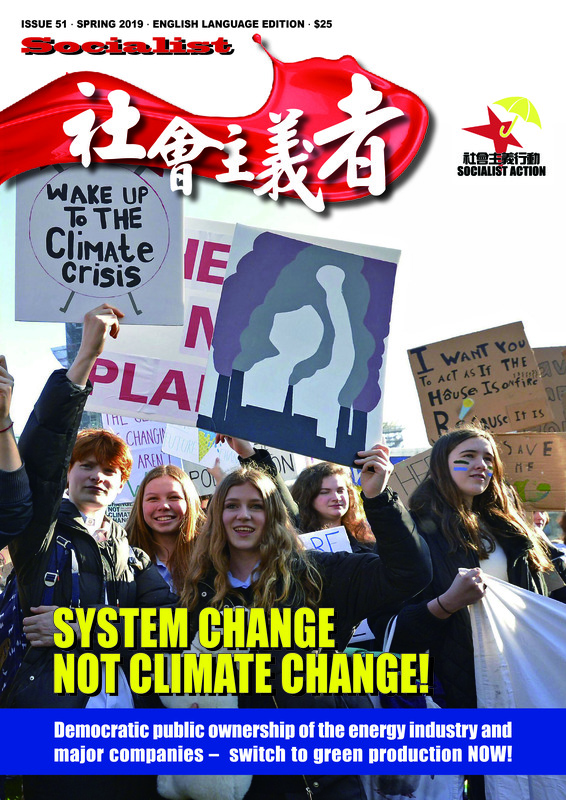 Socialist Action (CWI in Hong Kong) intervened the demonstrations with the new issue of Socialist magazine, featuring CY Leung and the former head of Security and now legislator, Regina Ip, conspiring together for Article 23. Our slogans, shouted through loudspeakers at our street station, including “Down with CY Leung, smash Article 23”, and “Down with property hegemony, down with capitalism”, were cheered by passing protesters. Sales of our magazine were around double the sales on last year’s demo.